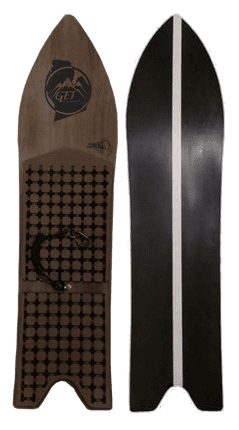 Our powder surfers are designed to be ridden much smaller than a traditional snowboard. By changing concave, rocker lines, and width, we are able to achieve incredible float in a much more maneuverable package allowing you to take them anywhere. 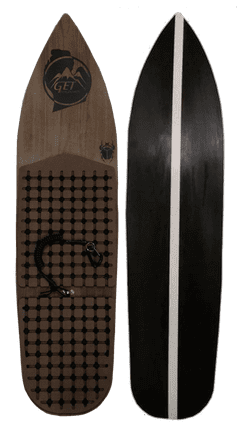 The powder surfers are great for smaller lines than you would typically ride on a snowboard. They can turn a less than ideal conditions into a fun day by allowing you to ride mellower and different lines. That being said, when heading out into the backcountry use the proper safety gear and precautions. It’s better to skip a day than miss the rest of your days. GET Industries Powder Surfers will not allow you to avoid avalanches, tree wells, hidden objects, or any other dangers you may encounter. GET Industries is also not responsible for your actions or any events caused due to your interaction in backcountry terrain. Know before you go, ride responsibly, and at your own risk.